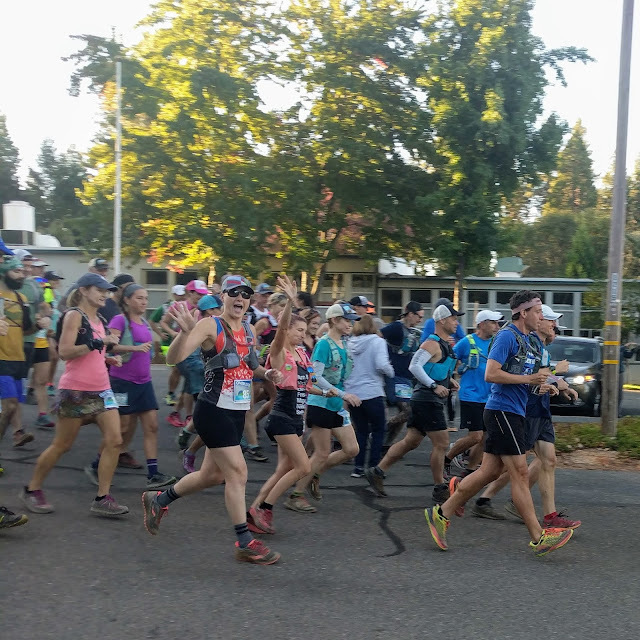 This past weekend I ran my fall goal race, Overlook 50K, which is yet another race located in Auburn along parts of the Western States trail. Are you seeing a pattern here? Although I'm not sure I'll ever want to attempt 100 miles, I'm still finding myself obsessed with running as much of the Western States trail as possible. I've run part of this course in the past while visiting Auburn to volunteer for States in 2016. 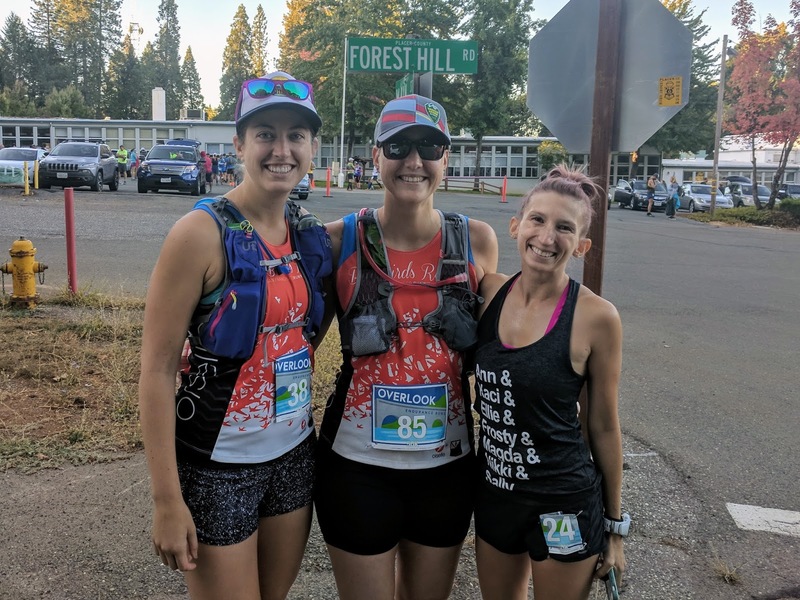 A group of us did an out and back from Foresthill to Cal-1; considering it's mostly downhill on the way out and mostly uphill on the way back, I was happy this 50K course only went in one direction. The race was a point-to-point starting at Foresthill and ending at Auburn Overlook, and a highlight was my first-ever American River crossing at Poverty Bar. Before the race, Kevin and I stayed in an amazing AirBnB in Foresthill starting on Thursday. 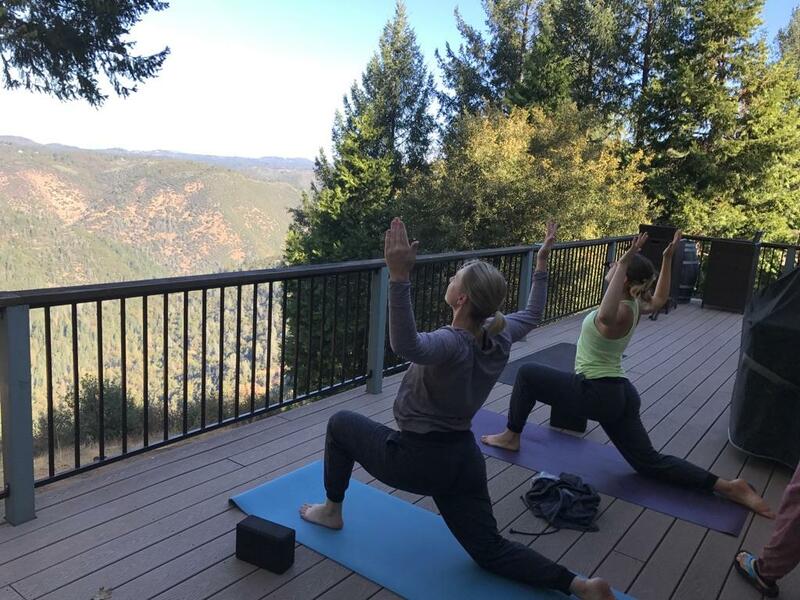 This place looked great online and did not disappoint; the house was beautiful inside plus it included a deck with a view of the American River canyon. Wow! 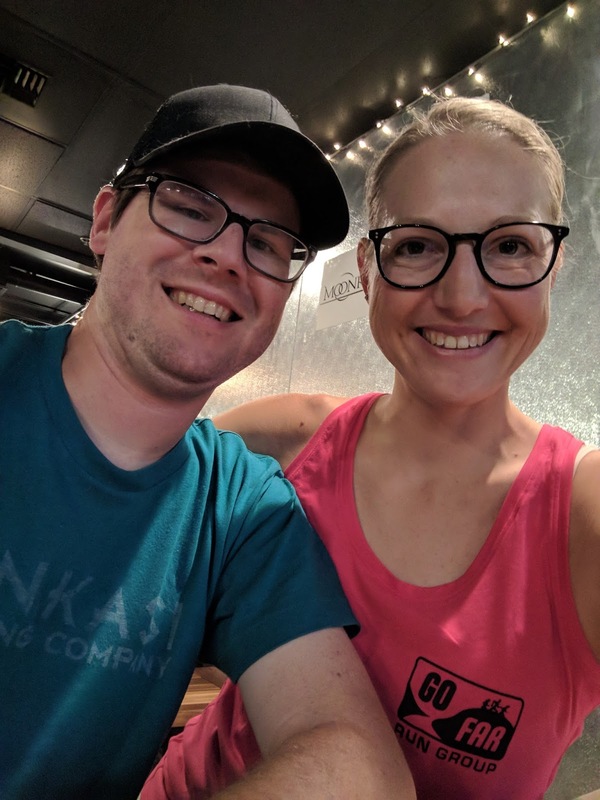 We also visited my new (as of March) favorite brewery, Moonraker, on Thursday. If you like hazy NE style IPAs, this place is a must-visit. On Friday morning, I made breakfast and we enjoyed our coffee on the deck. Later we headed out to the Foresthill Divide trailhead for a short shakeout run; my legs felt great and the trails were beautiful. I worried I felt too good - aren't taper runs supposed to feel terrible? Either way, my body and brain were pumped and ready to go for the 50K. Kevin is a great trail partner. We followed the run with lunch at Auburn Alehouse, where I enjoyed chicken tacos and a session IPA to keep it light. This brewery/restaurant is another great local place in Auburn; a huge bonus of racing in Auburn is the many awesome breweries in the area! We spent the rest of the day relaxing at the house. I tried to nap but became increasingly anxious thinking about the race. I wasn't necessarily worried about the race; it was more of an excited, 'let's go NOW' feeling. I took advantage of the AirBnB-provided adult coloring book to soothe my mind. I seriously think I need one of those at our house now. Later that afternoon, Jenny arrived at the house and provided me with a much needed distraction. We cooked dinner, ate on the deck, and then relaxed in the living room for a while. Sophia and Charlie arrived a bit later, and then the whole crew was there. I'm always happy to have friends running the race too. I slept well the night before the race and woke up at the luxurious time of 6:15 am. The race start time was 8 am and our house was only 10 minutes from the start, making the morning logistics very easy. We arrived at the start, grabbed our bibs, and still had a ton of time before the race would begin. The race director gathered everyone at the start (a line on the ground) about 5 minutes before, and soon we were off. This is yet another ultra where I didn't even know the race was starting until everyone moved forward, which always amuses me. It's quite the contrast from big road races where everything is crazy and logistically complex - and I love that about trail races. 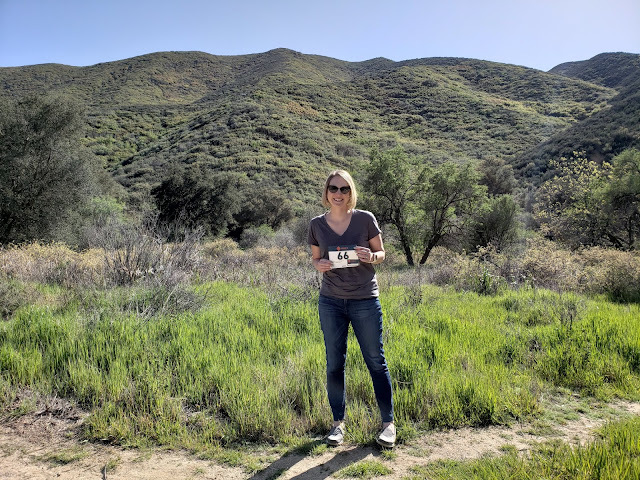 As soon as we started, Jenny said to think about placement because we were going to get bottle-necked into single track in about half a mile. My race plan was to go out fast and push at the beginning, which I never do and is way out of my comfort zone, and I definitely put out the effort! I wasn't able to stick with Jenny at the beginning as we hoped, but I did land in a good spot with the other runners around me. The pace was fast enough to push me, and shortly after the start I found myself with Matt and Kristin, friends from SF, so I had company. I'm terrible at letting myself push the pace (I get scared of not finishing), so my brain was telling me to back off within the first couple of miles. I fought it, and I didn't. Around mile 4 there was a short but steeper climb, and at that point I stepped out of the way to let the people immediately behind me pass. I was doing well but didn't feel the pace was going to be sustainable for long, and I wanted to back off just a little. I fell back into the group at a better pace, still faster than I'd normally attempt but less spicy than before. I once again found myself with someone I knew from the Bay Area, Dennis. The trail community really is the best. We continued on our merry way through the trees, down the elevator shaft (yes, this is what people call a steep and tough section of the trail), and to the first aid station at Peachstone, mile 8.7. I was greeted by Bonnie from Steven's Creek Striders, grabbed some Coke, and continued along the trail. The next section had more nice downhill followed by some sandy sections along the river. By this time it was heating up and all I could think about was crossing the river in the cool water. Unfortunately, I was still far from it. I was cursing myself for not paying attention to what mile marker the river crossing was at when I studied the course. I was feeling less-than-great at that point but kept myself chugging along, getting passed by a few people I had been hanging with for the past miles. I thought oh crap, I went out fast and I'm going to pay for it forever. Then I looked at my Garmin; I was just after mile 10. I know my body and I know I always have a weird mental struggle around mile 10. It's like clockwork, it always happens, and it's almost comforting to realize that's where I am on the course. My brain said oh cool, this is normal and it'll pass, no problem. I kept moving, and it passed within the next couple of miles. As we continued, I found myself alone for a long time and started to question if I was still on course after one of the splits. I've gone off course due to zoning out during two other 50Ks, so this isn't a random fear. However, I knew my path along the river made sense and kept going even though it felt like I hadn't seen a trail marking ribbon in 15 minutes. The next thing I knew, I turned a corner and saw Kevin! He'd come into the Rucky Chucky aid station (mile 16) to surprise me and I was absolutely thrilled. I badly needed a mental boost at that point, and I was happy to hear that Sophia and Jenny were doing well as he'd seen them come through earlier. An awesome Rucky Chucky volunteer took my pack and ziplock of Tailwind from me, filled and mixed it, and put it on my back before I left. It was incredibly helpful! Next came more trail along the river, and I was happy to catch back up to Dennis shortly after the aid station. It kept getting hotter; we talked about approaching the river. Where was that darn river crossing?! I passed a few more people and eventually, finally, found the river crossing around mile 18.5. A volunteer told me the river would be waist-high and off I went. I hadn't carried a phone, so I had no electronics to worry about dunking in the water. Volunteers and ropes helped us cross the river, a wider and deeper water crossing than I've experienced so far in my trail races. The water was much colder than I expected and it took a few minutes to cross, so by the time time I exited the water my legs were pretty numb. 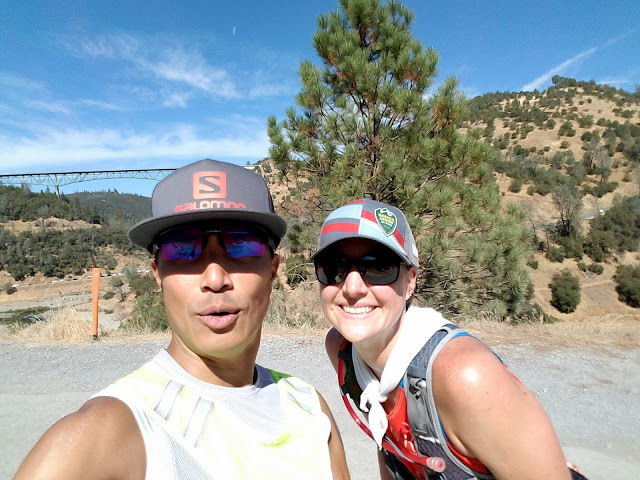 On the other side I found Leigh Ann, another SF trail runner I was excited to see along the way. It might sound strange to be excited to see people I know, but I find it really inspiring and comforting during these long races. The next part was pretty uneventful and involved more running along the wide, rolling fire road. About half mile before the No Hands Bridge aid station, I ran into Michael from the Bay Area, who was volunteering as a course marshal. Michael is aways positive and a joy to see along the course, whether he's running or volunteering! At the No Hands Bridge aid station, I stopped to refill my pack with calories. I decided to take my chances with the on-course Gu Rocktane because I only had 4.2 miles to the finish and that would save me time over filling water and mixing Tailwind again. I've used Gu Rocktane a few times and it isn't ideal on my stomach, but in small doses it's ok. One volunteer asked me if I wanted to eat while the other one said 'no, she's gotta get going so she can get under 7 hours!' Although this was indeed my goal and I thought I had plenty of buffer, he spooked me a little and I left feeling flustered and without my treat of Coke. Oh well! After crossing No Hands bridge the course heads uphill for 4 miles to the finish. Some of this is gradual uphill and it's not so bad, but by mile 26 the body is definitely feeling it. I killed this section when I ran Knickerbocker 35K in March, not so much during Overlook 50K. However, I'm still proud of myself for doing the best I could when it was hot and I was pretty darn tired. I focused on catching and passing people in front of me as I went, and this method of motivation was quite successful. I caught many people who had passed me earlier in the race and used each of those little wins to motivate myself even more. By the time we hit the steeper uphill section to Auburn Overlook, I was feeling good and knew what to expect of the course from the Knickerbocker finish. I gave it what I had left, finishing in 6:48 for an overall 35 minute 50K PR. Even better, Sophia and Jenny also PR'd, making it a very happy day for all of us! The race company spoiled us with a finish line party of burritos, local beer from Auburn Alehouse, and many snacks. I mostly went for the beer because my stomach takes liquids best after a race, and eventually I managed to eat part of a burrito too. 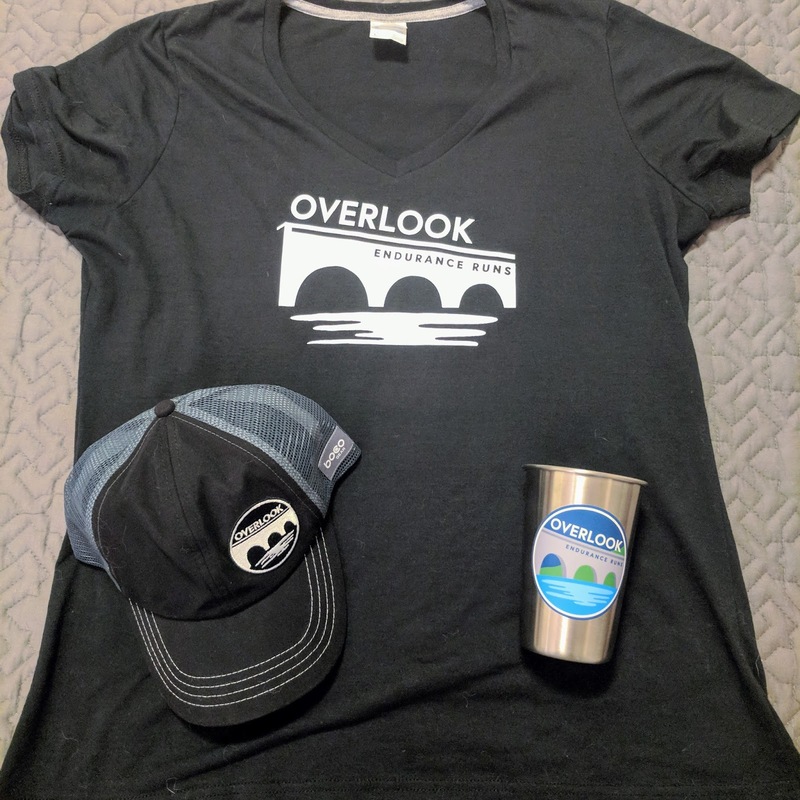 The race swag was fantastic and included a nice cotton shirt, technical trucker hat, sticker, stainless steel pint glass, and bottle-opener keychain. All in all, I loved the course and race management, and I'd definitely consider repeating this event in the future. Following the race we enjoyed beer and dinner at Moonraker Brewing, and on Sunday morning Jenny facilitated yoga recovery on the deck. It was the perfect ending to the weekend!